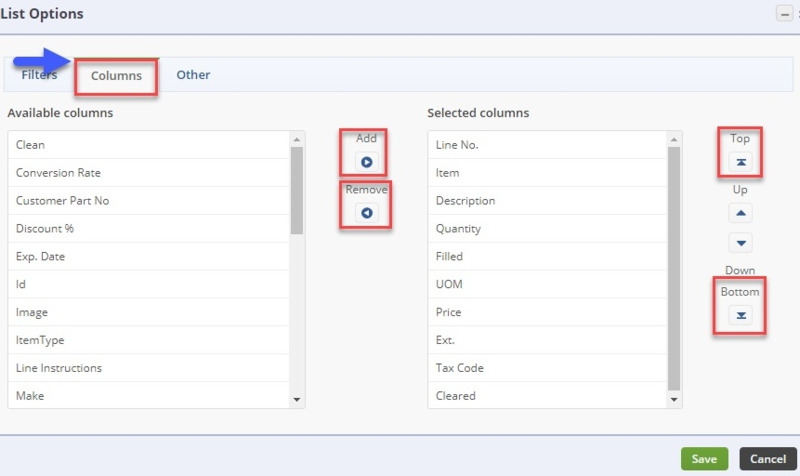 The Column Section lets you add and remove what columns are shown on the current screen. 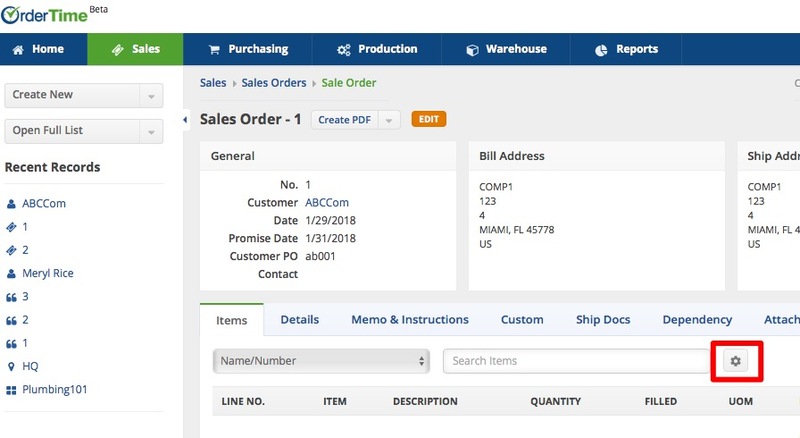 To modify your Lists Column click on the Gear icon on the Child List on the desired record (Sales Order, Ship Doc, Customers, etc). Once you click on the Gear icon, the List Options screen will be displayed. You add and remove what columns are shown on the current screen, you do so by selecting the column name under the Available Columns Section and pressing > icon to bring it to the Selected Columns Section. To Remove a Column, select it from the Selected Columns Section and press < icon. You can also change the order the Columns show by selecting the Column and pressing ⊼ to bring it to the top, ^ to move it up one spot, v icon to move it down one spot or ⊻ to bring it all the way to the bottom. This is helpful for sorting your information and simplifying it, to only view the information you want to see. Every List has a large number of both predefined and custom fields available for your use. These fields vary according to the particular List you are looking at. The Other Section allows you to select how many Records are shown Per Page, as well as, the default Search By Field.